While, as Christians, we believe in prayer when faced with a dilemma there are many on the ‘outside looking in’ and wanting to see what the church will do. 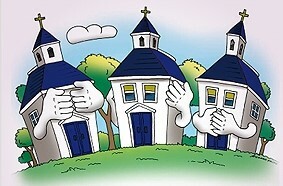 If they see the church avoiding an obvious church vs. politics situation and the church on the ‘outside’ doing nothing, then the assumption is that the church is helpless…or even worse, useless. As Christians we must not only ban together as members of God’s family, but we must set an obvious example to those who are on the outside looking in. As Christians we have dual citizenship and we must not forget that. That’s why I ask ‘Where’s the Church?’ in these episodes where taking a stand for Christ is challenged by the secular world. You can bet that the church will be constantly evaluated by the ‘world’. Do we ever wonder why church membership is declining in the US…and the world? Now we will continue with the stories of ‘challenge’. At East Liverpool High School in East Liverpool, Ohio, just moments before the graduation ceremony the senior class gathered in a nearby auditorium. Together they decided to do something that would make national headlines…and show up school leadership for the cowards that they are. Only a week before students learned they would no longer be allowed to sing “The Lord’s Prayer”, a graduation tradition dating back some seventy years. [Kendall Forward,”East Liverpool Students Reject Demand to Remove Lord’s Prayer From Graduation”, Sinclair Broadcast Group, May 22, 2016]. The school district in ‘cowardly tradition’ banned the song after…yours truly…Freedom From Religion Foundation complained that “The Lord’s Prayer” violated the US Constitution and promoted religion. Fearing a possible lawsuit, the district dropped the tradition which seemed to appease the perpetually offended atheists, agnostics, god-haters, and free thinkers from Wisconsin. At least the school district maintained one tradition…that of cowardly avoidance of conflict. You can read more about FFRF in the book God Less America. The entire community was devastated…I trust that included the churches. As the seniors lined up for graduation some of them started to talk about the ‘outlawed’…that’s politics…tradition. They decided to defy the FFRF. [Senior Bobby Hill in communication with Todd Starnes, May 2016]. When a few of the parents found out about the plan they were thrilled. [Mr. Hill in communication with Todd Starnes, May 2016]. Just after the valedictorian welcomed the crowd, the seniors stood and began committing their act of disobedience. “Our Father, which art in Heaven…”they spoke in unison. Some of the parents even started to tear up. It was an emotional moment; an example of Americans standing up for what they knew to be true and right. “It doesn’t matter if it’s over religion or something else…take a stand”. [Ibid]. Technically the graduating class did not break any rules. They were ordered not to sing. The school district did not say anything…that’s how cowards react when challenged. This is how Christians should react. If they don’t they might actually find themselves marginalized in any and every event where the Word of God is involved. I would hope that the churches take on this task and before the next election for the school board remind their congregations as to the failures of the previous board and the qualities desired of the next board. Churches, display the same courage that these students did. Next we will see that indoctrination is not just about what we believe, but can be used as a tool to shut people out of entire professions. Andrew Cash was a student at Missouri State University. He says he was kicked out of the master’s program in counseling because of his religious beliefs. During a session with his adviser he says he was “targeted and punished for expressing his Christian worldview regarding a hypothetical situation concerning whether he would provide counseling to a gay/homosexual couple.” [Andrew Cash v. The Governors of Missouri State University, United States District Court of Missouri Southern Division, Case No.2016-CV]. A spokeswoman for MSU told the local media that the “university strictly prohibits discrimination on the basis of religion or any other protected class.” (I guess that’s unless you are a Christian). [Harrison Keegan,”MSU Sued by Student Who Told Professor He Wouldn’t Counsel Gay Couples”, Springfield News-Leader, April 21, 2016]. Cash told his adviser he would counsel gays on a variety of issues but not as a couple. He further said his approach to counselling would be centered on his “core beliefs, values and Christian worldview and these would not be congruent with the likely values and needs of a gay couple.” [Andrew Cash v. The Governors of Missouri State University]. His adviser, Dr. Perryman then told Cash that he “could not hold these views, which she deemed unethical, and which, she asserted, contradicted the American Counseling Association’s code of ethics as discriminatory toward gay persons.” [Ibid]. “She took offense to Cash’s religious beliefs and kept dwelling on them until he was ‘drummed’ out of the program.” [Tom Olp, attorney for Thomas More Society…a law firm that specializes in religious liberty issues, in communication with Todd Starnes, May 2016]. Cash’s troubles began in the spring of 2011 when he began a university approved internship at the Springfield Marriage and Family Institute, a Christian organization. It was during a classroom presentation that the director of the Christian group was asked about counseling gay persons.” A week later Cash was informed he would no longer be allowed to intern at the institute. [Andrew Cash v. Governors of Missouri State University]. In 2014 Cash was just a few courses shy of graduating with a master’s degree in counseling. He had a 3.81 grade point average and was a student in good standing with the school. [Ibid]. His Christian beliefs had led to his dismissal and failure to receive a degree. His case is unfortunately not a first time event for Christians to be thrown out of counseling programs at public universities in Missouri as well as Michigan. [Tom Olp in communication with Todd Starnes, May 2016]. All Cash wants is to be readmitted to the program so he can finish his studies. He is living proof that we live in a nation where faith in Christ is now considered by some to be a career-killer. Where is the church in taking a stand for this Christian student? Next week we will look at a university where one must have a school approved permit to talk about Jesus. Then we will look at a school district…led by educated cowards…who do not want to offend anyone with Christian hymns. How long can our churches stand back and let this happen in silence? Can this be why so many of our countrymen can find no relevance in many of our churches?